In my experience over the past 10 years starting data analysis projects from the data increases the time of the project by at least 400% and in the case of larger data warehouse projects the time approaches infinity as they are only rarely completed successfully regardless of extensions to budget or time. In the movie Ground Hog day Bill Murray is forced to relive the same day again and again until he perceives that his behaviour has trapped him in the loop. Once he acheives this realization he is able to change the result of the day and move on. Oddly enough the EDRM, while it is a good guideline for those without a concept of E-Discovery, replicates the conditioning that was delivered to data warehouse and business intelligence clients. The same clients that now choose common tools, accelerated deployments and often by-pass data warehouses by taking valid transactional data from transactional sources and processing it overnight on servers that may be as small as a high powered laptop computer. We have complemented the image of the EDRM below to indicate in red potential opportunities to reduce costs or E-Discovery project time buy up to 80% by using existing client tools and common technologies applied in a focused way. 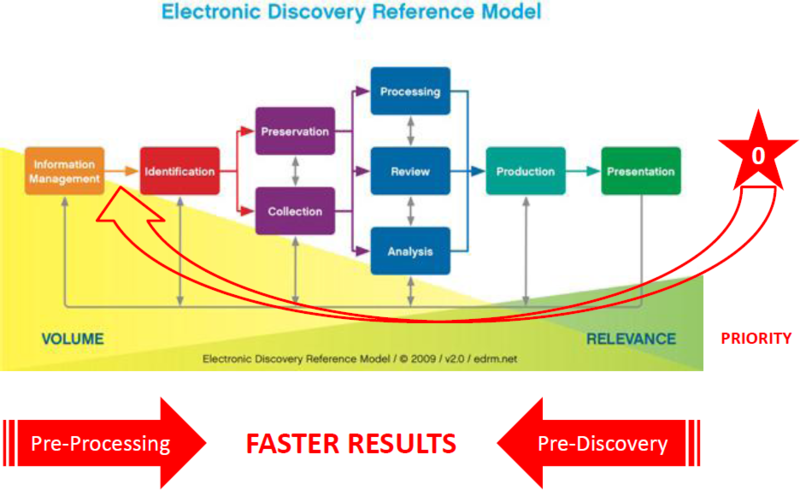 The red star with the “0” indicates where the E-Discovery process might begin to yield better, faster and cheaper results, at the end. Understanding the range of possible outcomes and associated behaviours, content and people associated to those results allows us to focus and prioritize where E-Discovery resources might be directed first and stopping when the results are good enough. For those situations where the risk of ‘good enough’ is just too high, starting from the end is still better and complements the usual method of capturing and analyzing everything as it allows negototiations related to the scope of the action to occur and possible mediation while the processes proceeds. Some law firms have ‘locked-in’ E-Discovery costs by contracting or outsourcing all of their projects fixing their costs while avoiding the potential cost savings possible by using common tools and approaching the E-Discovery process differenly. Contact us for more detail on a different way to deliver E-Discovery results to your clients by working with your vendors to use simple and common tools. Don’t forget to ask us about how SpeedSynch Resonance Maps speed up E-Discovery. Project times and risk exposures are increased by an ambitious desire to push higher volumes off-shore. E-Discovery projects that start from ‘atomic’ data perspectives to create inflexible project specifications that deliver low cost answers to the wrong questions or don’t attain the value promised as client or work requirements or objectives seem to change many times before project completion. Global E-Discovery outsourcers’ software ‘lock-in’ processes ill-suited to the work at hand. Privacy issues linked to documents bound by multiple jurisdictions, contractual or moral charges. The good news for law firms with smaller E-Discovery practices is that some of the largest law firms have locked in contracts, one recently in excess of $500,000,000. Long term contracts with global E-Discovery supply chain partners virtually eliminates the benefits of constant innovation with new processes, new software or the ability to exploit positive changes in E-Discovery trends shaped by concepts like Proportionality or Mediation. Indeed the specific design of E-Discovery ‘factories’ offered by E-Discovery outsourcers include products from database vendors or specialized E-Discovery software to cut costs. However this ‘factory’ must be feed with high content volumes and associated processes that may actually later add costs to the discovery process but must be executed for the factory to function. We employ proven Semantic technology and Content Resonance innovations to facilitate, enrich or accelerate E-Discovery and uncover hidden value during the discovery process. Contact us about speeding up E-Discovery projects or getting more value from your E-Discovery investments.